These crisps go a long way to explain that they are from a Devonshire company. They even proudly state that even the chillies used in the recipe are from Devon too. This leads me to question the name of the product, why is such an obviously English product known as ‘chips’ not ‘crisps’. I know this isn’t the first time this has been mentioned on this website, but the word ‘chips’ is just very American to me. It just seems strange from a company so proud to be English everywhere on its packaging, “Made In Devon” is even emblazoned across the front of the bag. This variety of ‘Firecracker Lobster’ sounded as if it might be similar to a spicy prawn cocktail flavour, but when I opened the bag I realised at once I was mistaken. These crisps have a spicy aroma, and were lacking the sweet tomato edge you’d expect in prawn cocktail. The texture of each crisp is of a moderate thickness, thicker than Walkers, but not a crunchy as Kettle Chips. The flavour is salty and spicy, and does surprisingly recreate a lobster seafood taste remarkably well. When you finish each crisp you are left with a nice tingle from the chilli, but it is a gentle non offensive heat, leaving just a light buzz on the taste buds. The salty nature of these crisps makes them very moreish, and easy to eat, and I thoroughly enjoyed the bag. Several of their other flavours they make sound rather appetising too – so I think I will be making an attempt to hunt down their Hot Chilli Lemon as well. 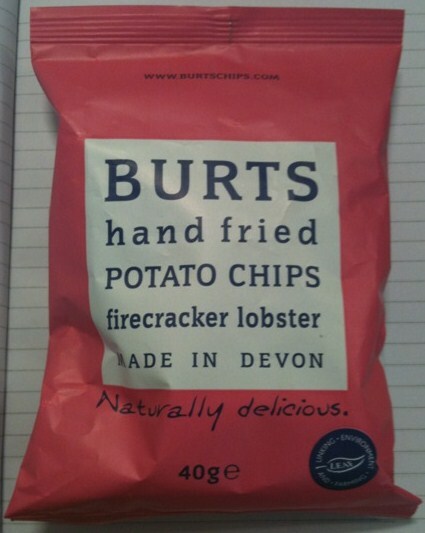 A work colleague recently went to Hong Kong and found Burts Chips in a corner shop there. I guess they call them chips as opposed to crisps because of the export market.